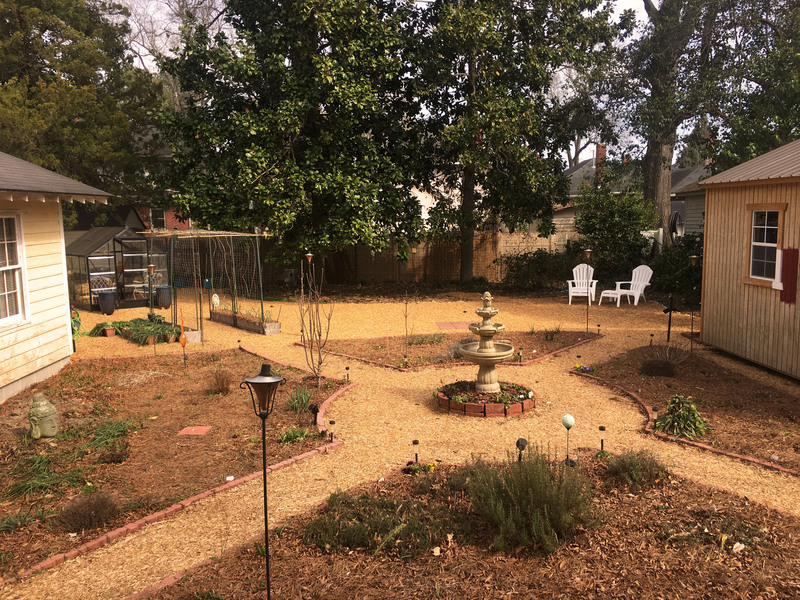 This weekend we managed to come close to completing the grand mulching project! It won’t be too long before all grass is eradicated in the back yard. A view towards the tool shed. 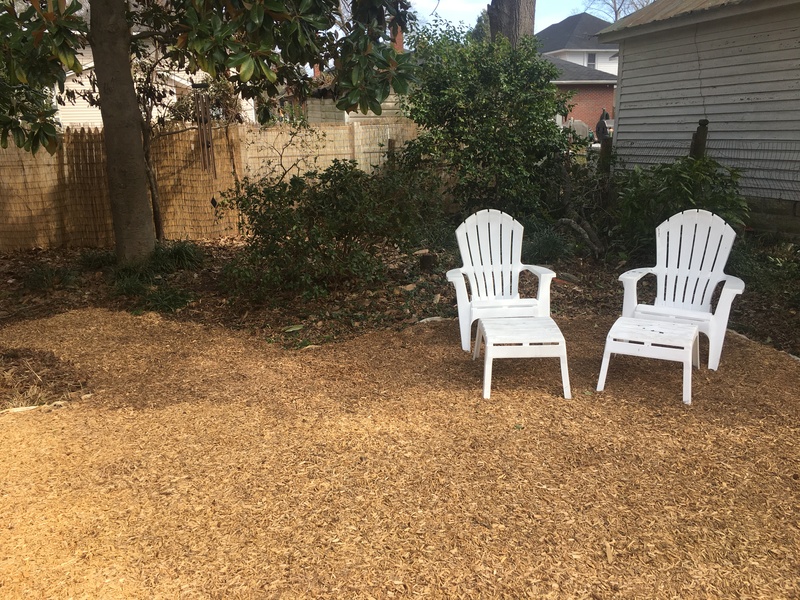 This is by far the largest open area to be mulched. This area will be used for working on projects and will be a container area for growing more vegetables. I purchased a VegTrug for this area to grow lettuce, Pak Choi, carrots and strawberries. There also will be 4 grow bags for potatoes, cucumbers and courgette. 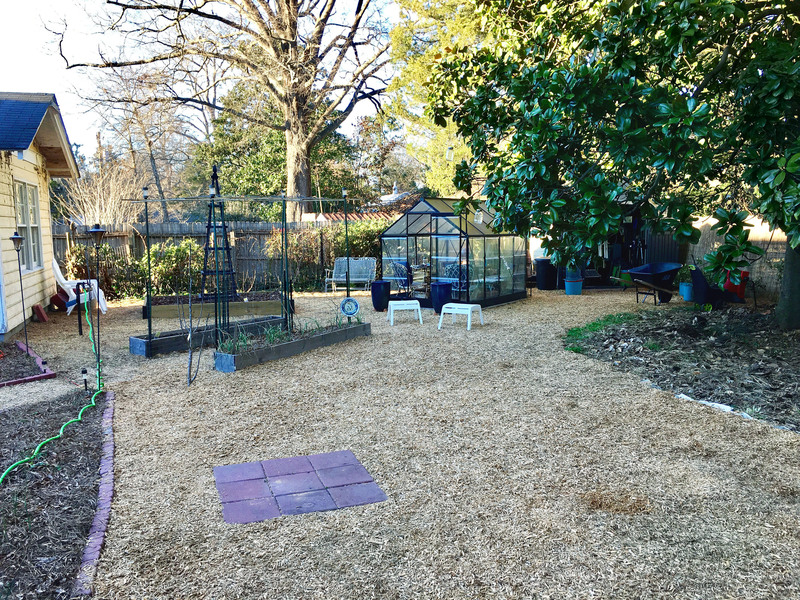 A new seating area was created that sits off to the side and back of the tool shed giving you a perfect view of the kitchen garden and the sky for star watching. 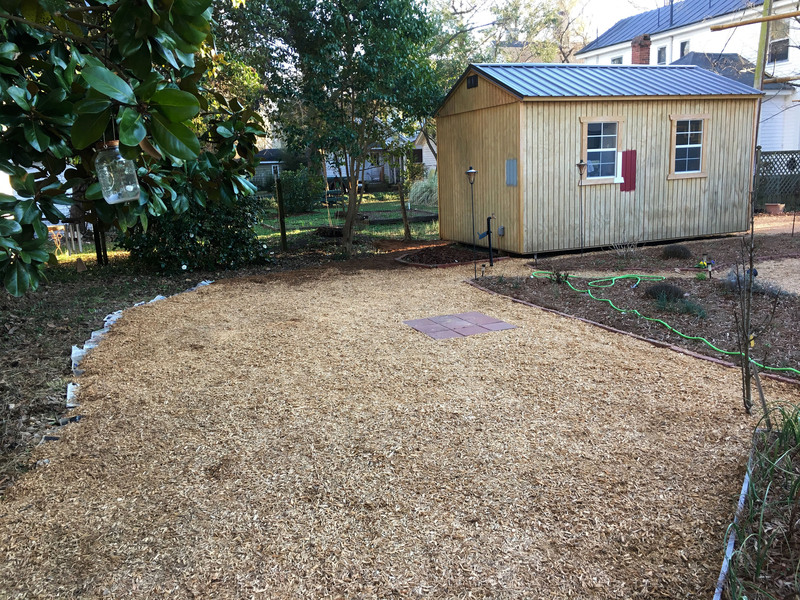 In the photo above you can see the beginning of a new path that will lead to the future ‘Magnolia Pavilion.’ I am going to use pine straw for the area behind the sitting area and all under the magnolia trees. 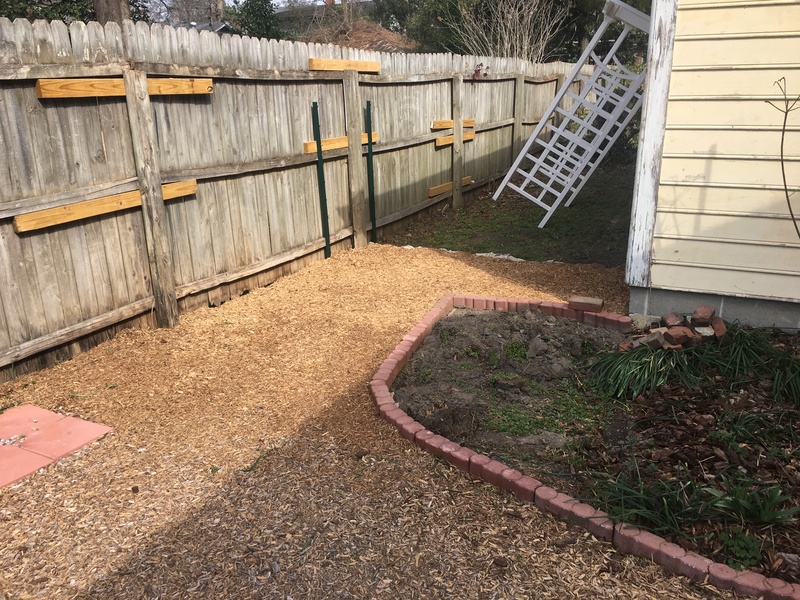 This should create a nice thick layer of mulch to help keep weeds down and will last long, but it will also add another texture to the garden. The final stretch is the side of the cottage that will be a utility area for the garden. Once this area is finished… there will be no more grass. NO MORE MOWING! In other news, we seem to have an almost endless supply of Lycoris (Spider Lily). One of the beds in the kitchen garden was once part of another garden perhaps dating back to 1914 when the house was built. I can imagine they were planted then due to amount of bulbs we keep digging up! In the bed that is next to the cottage they seem to have appeared almost out of the blue. 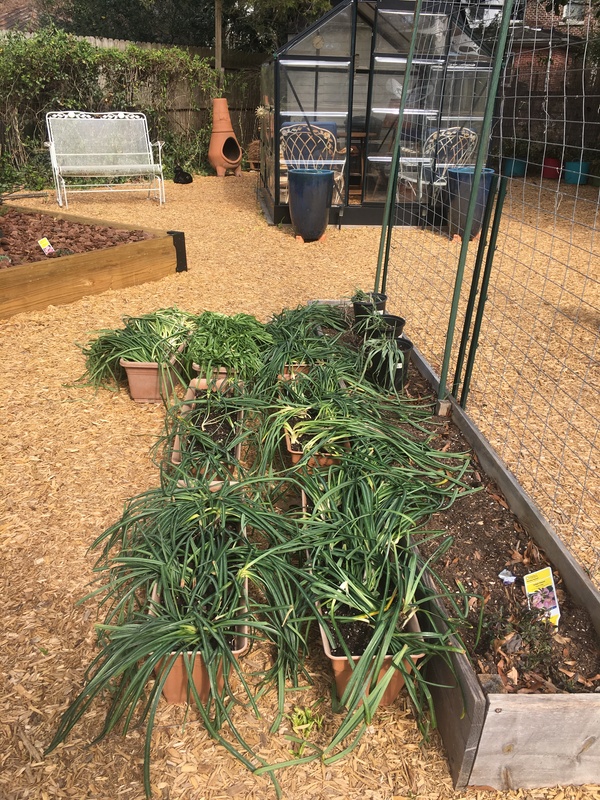 I assume when the first harvest happened it broke up the clumps and many bulbs were left behind and when the bed was prepared for vegetables the bulbs moved around, which gave them space to grow. There is plenty of planting in the future! Yes, I am going to do this in autumn. Thank you for stopping by!